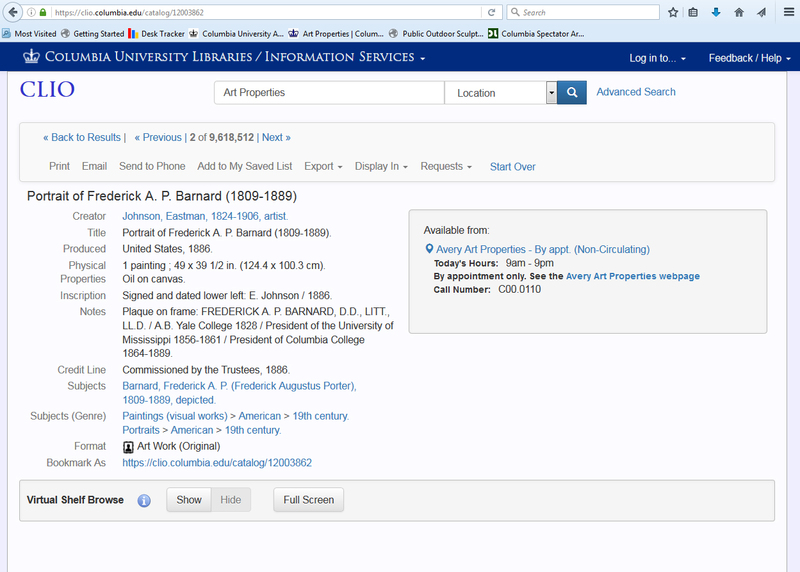 For the first time, it is now possible to search for selected works from the Columbia University art collection. Art Properties, Avery Library, is pleased to announce the release of over 2,000 item records for cultural artifacts and works of art. Among the items in this release are more than 400 oil paintings, 650 photographs, 400 drawings, watercolors, and prints, and decorative arts. Also included are records for the entire public outdoor sculpture collection, recent acquisitions to the collection, and highlights from the renowned Sackler Collections of East Asian and Near Eastern art. Then select Location from the drop-down menu. 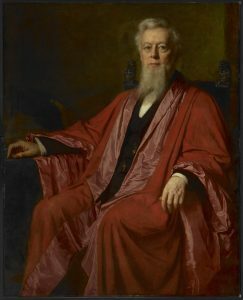 Below is a sample CLIO record for the work you see above, a portrait of Columbia President Frederick A. P. Barnard, painted by Eastman Johnson in 1886. When searching in CLIO for a particular artist or topic, it is possible to narrow search results to show only art works from the collection. To do this, limit Format to “Art Works (Original).” For instance, if you search for “Andy Warhol,” you can limit your format option to see item records for all original works of art by Warhol in the University collection. Other advanced search options include using subject headings such as culture, century, and genre type to expand or narrow your search. The amount of descriptive information that appears in each item record varies, but these records will be enhanced over time as new research is conducted on the collection. Although there are no images attached to these records, Art Properties gradually is advancing in its initiative to digitize the collection and make images available to the public as well. Our thanks to colleagues in the Columbia University Libraries’ cataloging and technology divisions for their collaboration with staff from the Avery Architectural & Fine Arts Library and Art Properties on development of the Art Properties Description-to-Discovery Project. Works from the University art collection are available for research and study, curricular integration, and educational programs, as well as for exhibition loans to museums and institutions. To make an appointment to see works from the University art collection, contact Art Properties at 212-854-2877 or artproperties@library.columbia.edu. This entry was posted in Art Properties on June 22, 2016 by Ted. The Rare Book and Manuscript Section of the American Library Association defines viewbooks as a type of published booklet “consisting primarily of views of particular places, events, and activities, sometimes connected by accordion folds.” Avery Classics holds more than 4,000 such titles, focusing almost exclusively on American towns and cities at the end of the 19th- and beginning of the 20th-century. These ephemeral publications were originally intended for a variety of purposes – as souvenirs to be purchased by tourists, as advertisements to prospective residents, and as published records of specific events. Heavily illustrated, viewbooks often include images of new civic buildings, businesses on Main Street and various other features of the local built environment. For today’s researcher, viewbooks are a wonderful window into a past America, one in the midst of rapid urban and suburban development. 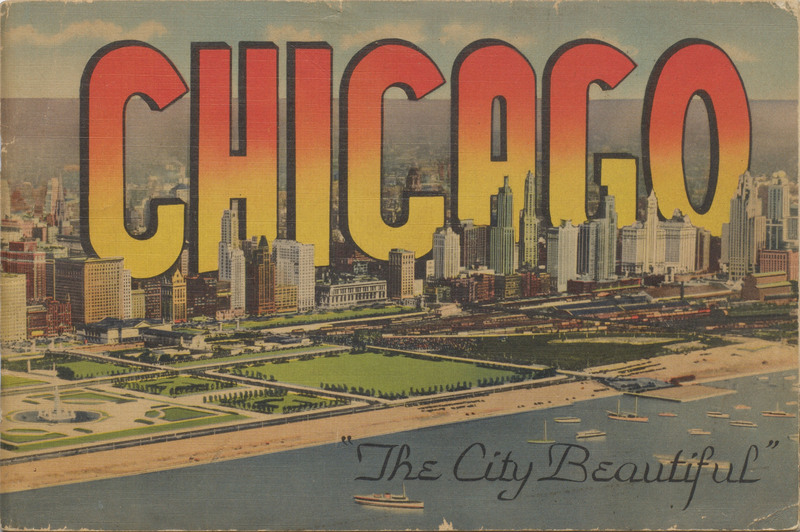 Viewbooks have survived as accidental records of the changing architectural landscape across America at the turn of the century. They chronicle the developing and uniquely-American vernacular architecture vocabulary. They also provide a window into the rapidly changing printing and publishing landscape. Making use of new technologies to reproduce photographs quickly and cheaply, viewbooks are an excellent way to approach the history of printing and the accessibility of printed matter. Finally, viewbooks give modern-day readers a glimpse of how towns and cities across the country – some still thriving, others long faded – presented themselves and positioned themselves for the future. From New Holstein, Wisconsin to New York City, Viewbooks represent a place’s attempt to put its best foot forward and to situate itself in the greater American cultural landscape. This entry was posted in Avery Classics Collection on June 21, 2016 by Ted. Avery Classics materials feature prominently in a new exhibition at the Morgan Library & Museum entitled City of the Soul: Rome and the Romantics. As the curators of the show point out, “Rome exists not only as an intensely physical place, but also as a romantic idea onto which artists, poets, and writers project their own imaginations and longings. City of the Soul examines the evolving image of Rome in art and literature with a display of books, manuscripts, prints, photographs, and drawings.” Among the items loaned by Avery Classics are a panorama of Rome from The Illustrated London News (above), a travel album with hand-colored images of Rome that may have belonged to Friedrich Wilhelm, King of Prussia, and a detailed map of the city produced by Paul-Marie Letarouilly in 1841. Avery Digital Lab prepared a high-resolution digital image of the Letarouilly map, which was used by the Morgan to create a digital walking tour of Rome, allowing visitors to see some of the works on display next to modern-day images of the monuments. This entry was posted in Avery Classics Collection, Avery on the Road on June 16, 2016 by Ted.